Uraga. Laid down at Uraga Dock Co. as Yard No. 418, a 6,798-ton cargo ship for Yamashita Kisen (Steamship Co.), K. K. of Kobe. launched and named YAMAURA MARU. Completed and placed in service on Yamashita Kisen’s routes. YAMAURA MARU arrives at the Panama Canal. YAMAURA MARU arrives at Buenos Aires, Argentina carrying Jewish immigrants from wartime Europe. Requisitioned by the Imperial Army (IJA) and converted to a troop transport. Allotted Army No. IJA No. 970. YAMAURA MARU departs Hong Kong in an Invasion Force also consisting of AFRICA, MIIKE, RYOYO and ZENYO MARUs, carrying 5,300 men of MajGen Ito Takeo’s 38th Infantry Group consisting of Headquarters & supporting units, 3rd Battalion, 228th Infantry Regiment, main force of 1st Mountain Artillery Battlaion, 1st Battalion, 228th Infantry Regiment and 2nd Battalion, 228th Infantry Regiment. At midnight, YAMAURA MARU departs Bangka anchorage, near Menado, with the Ambon invasion convoy also consisting of transports AFRICA, HINO, KATSURAGI, KIRISHIMA, MIIKE, RYOYO, YAMAFUKU, YAMAGIRI and ZENYO MARUs carrying Rear Admiral (later Vice Admiral) Hatakeyama Koichiro's (39) (former CO of KINUGASA) No. 1 Kure Special Naval Landing Force (SNLF), elements of the Sasebo SNLF and the 228th Infantry Regiment. YAMAURA MARU carries the 2nd Battalion, 228th Infantry Regiment, 38th Division. Landings proceed during the night of Jan 30-31 by the No. 1 Kure SNLF at Hitu-Iama on the North coast, and by the IJA’s 228th Infantry Regiment on the southern coast of Laitamor. The defenders are at a disadvantage to contest the landings as only a few Dutch detachments are in the area. At Hitu-Iama on the north coast, the defending infantry and machine-gun crews are quickly overwhelmed and bridges on the road leading to Paso are left intact allowing the Japanese to speedily advance south across the Hitu Peninsula. Other landings occur around Hutumori where the Japanese split westward to the town and northward to Paso. The Japanese compel captured Ambonese to act as guides. The Japanese pass through a gap in the south at Batugong that falls on Jan 31st. At 0500, YAMAURA MARU departs Ambon for Koepang, Dutch Timor in an invasion convoy also consisting of transports transports AFRICA, MIIKE, RYOYO and ZENYO MARUs escorted by DesDiv 24's KAWAKAZE and YAMAKAZE, patrol boats PB-1, PB-2 and PB-34, MineSweepDiv 21's W-7 and W-8, and a subchaser. En route, KUNIKAWA MARU joins the convoy from Kendari, Celebes (Sulawesi). At 0230, the 2nd Echelon consisting of IJA transport YAMAURA MARU temporarily under the control of the IJN, fast transport (converted destroyer) PB-34 and four unidentified transports departs Ambon for Portuguese East Timor escorted by Rear Admiral (later Vice Admiral) Tanaka Raizo’s DesRon 2 JINTSU (F) and DesDiv 7’s USHIO and SAZANAMI. Air cover is provided by Mitsubishi F1M2 “Pete” floatplanes from the seaplane carrier MIZUHO. Enroute, they are joined by IJN transport NISSHUN MARU from Kendari. 19 February 1942: That night, both convoys arrive off Timor. Operating as part of the American-British-Dutch-Australian ABDA FLOAT, the U. S. Asiatic Fleet's USS PIKE (SS-173) under under LtCdr William A. New (USNA ’25), LtCdr Lewis Wallace's (USNA ’25) TARPON (SS-175) and LtCdr B. E. Bacon's (USNA ’25) PICKEREL (SS-177) make contact with the invasion force. Dutch West Timor. At 0235, landings begin on the east and west sides of Cape Mali coast. By 0315, the landings are completed without resistance. The Kupang force then heads over the mountains towards Kupang. At 1030, An unknown number of transport planes drop LtCdr Fukumi Koichi’s No. 3 Yokosuka SNLF paratroops 4 km NW of Babau. Alor island. At 0243, USS PIKE attacks what LtCdr New misidentifies as two "light cruisers". The ships, in fact, are W-7 and W-8. New fires two torpedoes from 4,000 yards, but they miss ahead. The minesweepers move out of range before New can set up for another attack. Portuguese East Timor. At 0030, the 2nd Echelon arrives 1 km NW of Dili. Landings begin, but fierce resistance is encountered. Destroyers USHIO and SAZANAMI take the enemy positions under fire. Because of the resistance, the landing craft head westward. At 0218, landings begin at the mouth of the Carmona River. By 1100, Buton airfield is captured and by 1230 Dili Town is also captured. At 1500 YAMAURA MARU departs Dili in a convoy also consisting of KASUGA MARU escorted by patrol boats PB-1 and PB-2. At 0700, the convoy arrives at Kupang. At 0900, YAMAURA MARU departs Hesaki south through the Bungo Straits in a convoy also consisting of NAGARA, OTOWASAN and RYOYO, MARUs escorted by minelayer NASAMI. YAMAURA MARU departs Shortlands for Guadalcanal, Solomons with Rear Admiral (later Vice Admiral) Tanaka Raizo's Reinforcement Group’s troop transports carrying Maj Gen Tanabe Suketomo's 38th Army ("Sendai") Division and Special Naval Landing Force (SNLF) troops, equipment and provisions in the No. 2 Butai also consisting of ARIZONA, BRISBANE, KINUGAWA, SHINANOGAWA and YAMAZUKI MARUs accompanied by the No. 1 Butai consisting of CANBERRA, HIROKAWA, NAGARA, NAKO and SADO MARUs all escorted by DesRon 2’s AMAGIRI, HAYASHIO, KAGERO, KAWAKAZE, MAKINAMI, MOCHIZUKI, NAGANAMI, OYASHIO, SUZUKAZE, TAKANAMI and UMIKAZE. No. 2 Butai is to unload at Argulio Point, near Cape Esperance while the faster No. 1 Butai is to unload at Tassafaronga. At 1730, YAMAURA MARU again departs Shortlands for Guadalcanal, Solomons with Rear Admiral (later Vice Admiral) Tanaka Raizo's Reinforcement Group’s ten other troop transports and 11 destroyers. Air cover is provided by the 11th Air Fleet and the R-Area Air Force's floatplane fighters. The remaining four transports YAMAURA, HIROKAWA, KINUGAWA and YAMAZUKI MARU and four destroyers continue towards Guadalcanal. After nightfall, they stop west of Guadalcanal, awaiting the conclusion of the Second Naval Battle of Guadalcanal during the night of 14-15 November. Admiral Kondo orders Tanaka to beach his troop convoy at Tassafaronga. At, 0051, Tanaka’s remaining four transports get underway from an anchorage where they had taken refuge during a squall. By about 0400, HIROKAWA and KINUGAWA MARU’s captains’ beach their ships in the mouth of the Bonegi River near Tassafaronga. 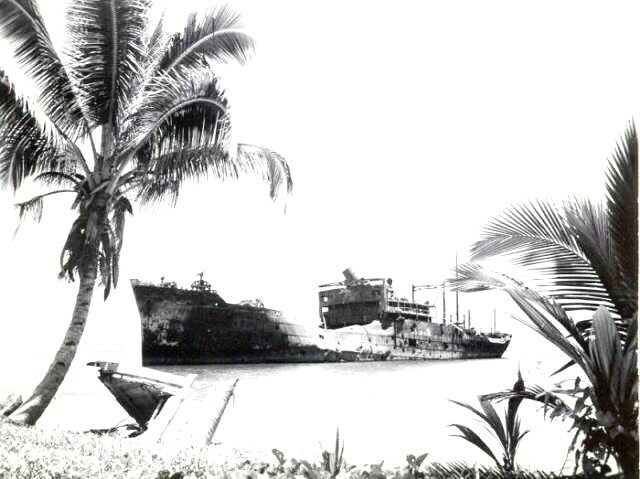 YAMATZUKI MARU is beached at Aruligo Point. YAMAURA MARU’s captain runs her aground in Doma Cove at 08-58S, 159-06E. By dawn, about 2,000 troops aboard the transports make shore.